Plastics composites date to the earliest days in the automotive industry when wood was used as a reinforcing material. In the 1950s, General Motors launched a composite-sheathed Corvette, seemingly starting a composites boom. Chrysler reignited the flame when it launched the Viper. And as the 12th annual Automotive Composites Conference & Exhibition kicked off in Troy, MI today, it appeared that all the ducks were lining up nicely for that long-awaited composites surge to take place. Automotive mileage requirements are rising significantly and new regulations are expected to reduce greenhouse gases that can be emitted from cars. But that wasn’t the tone at a kick-off panel discussion of industry experts. “This is the fourth composites revolution we have been promised,” said George Ritter, a principal engineer at the Edison Welding Institute. He said phones have been buzzing at EWI with engineers trying to find solutions to vexing assembly problems with composites. Paintability is also a significant concern, he said. Even stronger comments came from Saad Abouzahr, senior manager, materials engineering, at Chrysler, who said that–except for a few niche applications–Chrysler’s lightweighting material of choice is aluminum. “Where did all of the composites go?” asked Abouzahr pointing to the temporary bounce for resin transfer molded composite panels more than 25 years ago. “You have to look at the technology gaps,” he continued. One problem was the weight of the glass-reinforced compound. He also said that aluminum scores better than composites on stiffness, energy management and Class A finish. “Unless the technology gaps are resolved, we are going to stay with metal,” he added. Antony Dodworth, a composites designer with significant experience in Europe, said Volkswagen used carbon-reinforced plastic composites for structural parts in the 1-liter concept car designed to travel 100 km on one liter of diesel fuel. “They did not go into production with the composite parts because of the volatility of pricing.” Carbon fiber pricing jumped from around €9 to €16/kg. “In the space of about two years, prices doubled.” The car was modified in 2009 and again last year as the XL1. He said many of the technical issues are being addressed, notably processing times. New out-of-autoclave technology cuts cycle times by 75%. Lownsdale also said alliances are developing among major companies to assure supply continuity for carbon fiber supplies, a move that is expected to stabilize costs. He also pointed to favorable mechanical properties of carbon composites, such as its strength-to-weight ratio. In July, Lownsdale was named the 2012 Lifetime Achievement Award winner by the Society of the Plastics Industry’s Automotive Division. 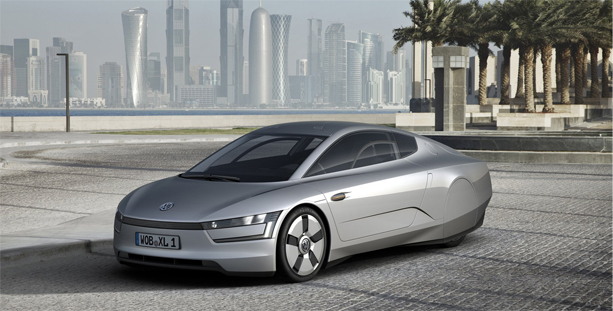 And it should be noted that plastic composites are still playing an important role in VW’s XL1 concept car. Volkswagen says it developed and patented a new system for the manufacture of CFRP parts on the car using the RTM process. Aluminum is used for dampers, steering system parts , brake calipers.